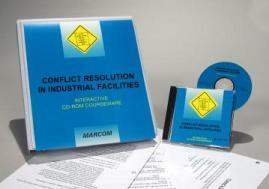 'MARCOM's "Conflict Resolution in Industrial Facilities" Interactive CD-ROM Course discusses the techniques and strategies that can be used to limit the damage and disruption conflict can sometimes cause in the workplace. Conflict in the workplace is inevitable. Anytime two or more people come together, they will eventually disagree about something. While some conflict can be healthy, it is often an indication that there is something wrong. The good news about conflict is that it is usually based on "caring". The more someone defends their point of view in an argument, the more they care. But if conflict is allowed to fester and grow without a resolution, it can lead to serious problems such as threats and even physical violence. This course shows employees that when difficult situations are dealt with in a calm and unemotional way, compromise and collaboration are possible... and a lot can be gained from resolving a conflict. Areas included in the course include the consequences of conflict and how it can disrupt the workplace, how resolving workplace conflict is an integral part of everyone's job, common causes of workplace conflict and how to recognize them, diffusing disagreements before they get out of hand, the damage that escalating conflict and violence can do to an organization, how collaboration can be a voluable tool in resolving conflicts, how to apply proven conflict resolution techniques and strategies, and more. Using a powerful combination of audio, full-motion video, text and colorful graphics, this course provides the most cost-effective safety and regulatory compliance training available today. The course is divided into a number of logical sections so information is easily understood... and retained. Also designed with the training manager in mind, all courses in the Interactive CD-ROM Training Library include a learning management system (at no additional cost). Using this system, trainers can set up "Pre" and "Post" tests... establish log-in procedures... even define and set up curriculum for various job classes. The system also collects and organizes employee performance information through a powerful relational database, which can generate a number of record-keeping and tracking reports... and has a database "import/export" feature, which allows information to be transferred to and from an external database (such as a company's personnel database). The course is one of over 100 titles currently available in the Interactive CD-ROM Training Library.